Meet Pickle, Our Week in Review, and Sleep Issues! Yep, the title says it all.....been busy. 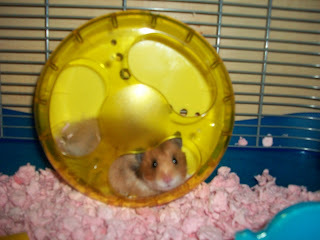 Yep, A got a hamster this weekend and she named him Pickle. He's pretty feisty and so far does not like us very much. LOL. Hoping that changes and he starts to get a little more friendly. Word families Dad turned 38 this week, so she put cupcakes numbered 30-40 in order in honor of him LOL And A practiced writing in the sand. 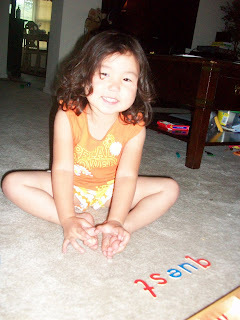 This week I introduced the actual terms for place value to A, and she grasped the concept in about 30 secs. 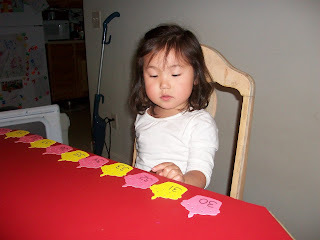 She can now look at any number 1-100, and tell how any tens and how many ones are in the number. I also noticed that her speed in reading double digit numbers just jumped ten fold. Completely fluent now. She is loving it. 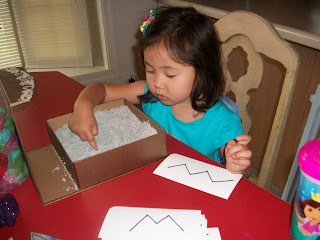 I am working on some Montessori Hundred squared right now to introduce the hundreds place. She also read "Who Will Be My Friends?" By Sid Hoff, and only needed help with the word "right" and "caught" even though I know she had never seen many of the words before. I was working on Tom's cake and she sat down and read to me, she also took this book in the car that afternoon and read it again. She was so fluent. It is amazing to see how much she is improving everyday! On to the last part of this title and the reason I have not been blogging this week. Horrible Horrible Sleep issues. Yep, starting Wed night, A started being terrified to go to sleep. It has been taking 4 hours of her screaming, us talking to her, trying everything we know, to get her to sleep the past few nights. But cross my fingers, I think we figured it out tonight. She was talking about a noise, and well I realized the motor in her little fan had started making a strange noise around that time. We took her to the store and she picked out a new fan and a bear "to make her feel safe" Well, a few wake ups tonight but she is sleeping and no screaming or crying....fingers crossed please! How exciting to have such a leap on place value! I'm so sorry for your struggles with sleep. Did Ansley ever have reflux as a baby? I love your sandbox tracing work. I am glad Ansley and you guys managed to get some sleep. Thanks for sharing. 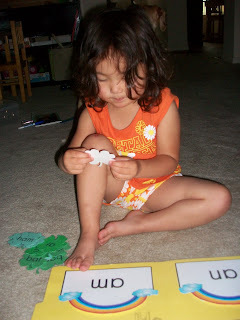 I have been afraid to introduce place value to young ones, but if their ready Go for it!! Great work Ansley!! Kelly- yes she did have reflux as a baby. It was awful and she was on previcid. Thanks for the comments yall. So far so good on the sleep, the last few nights she has even gone to bed with no one in her room. So apparently the bear and new fan worked!